1. Heat oil in a large pot over medium high heat. 2. Add onion, carrots and garlic and sauté 8 to 10 minutes or until beginning to soften. 3. Add paprika, cumin, coriander and ginger and cook 1 minute more. 4. Add quinoa and broth and stir to combine. 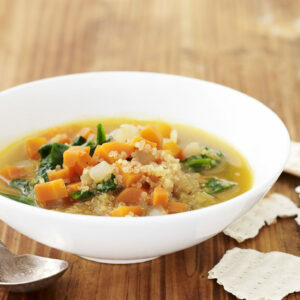 Bring to a boil, reduce to a simmer and cook for 15 minutes or until carrots are tender and quinoa is cooked. 5. Stir in spinach and season to taste with salt and pepper. 6. Divide soup between 6 bowls and serve with matzo crackers on the side.